Here’s what I’m doing today in the studio. Having fun carving some sweater ornaments. A variety of colors and yoke designs will be available soon! 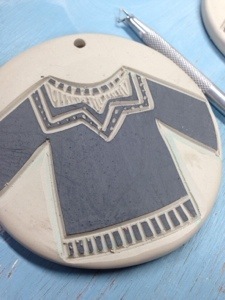 This entry was posted in Uncategorized and tagged ornaments, process, studio on November 26, 2013 by Jennie.